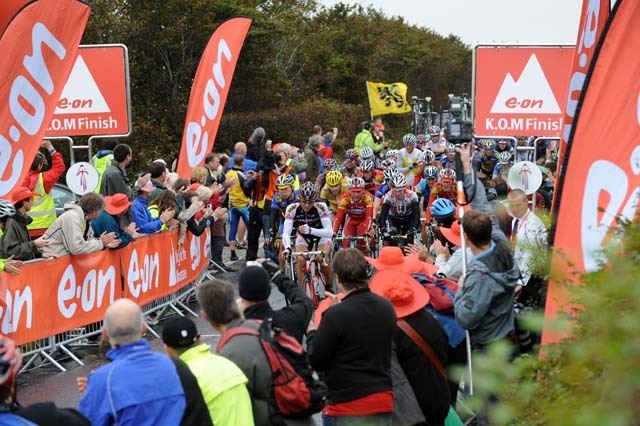 The French Agritubel team took control of the Tour of Britain on Tuesday, with Emilien Berges winning stage three over Exmoor to Burnham on Sea and taking the overall race lead. His team mate Geoffroy Lequatre finished second, 30 seconds behind, to complete a near perfect day for the team. Berges now leads Lequatre by 29 seconds in the overall standings. 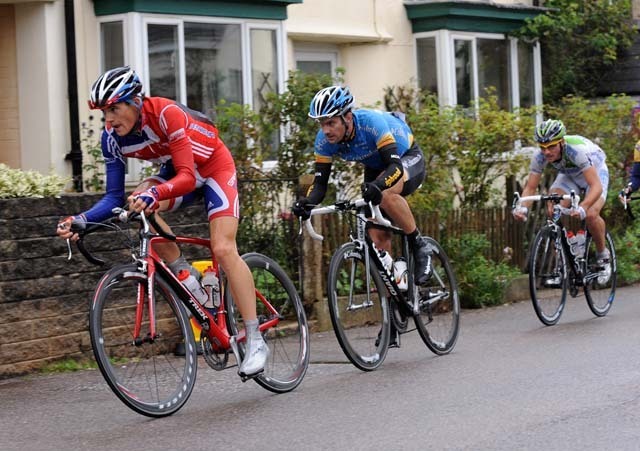 With the wind blowing and rain falling for most of the day, the 185km stage over Exmoor produced some great racing. For some it was a day of success or failure up front in the action, for others it was a day of survival. The main bunch, including David Millar (Garmin), Tyler Hamilton (Rock Racing), Danilo Di Luca (LPR) and Bradley Wiggins (Columbia) finished a massive 13-02 behind Berges. They will have to chase individual stage success for the rest of the race. British riders Steve Cummings (Barloworld), Dan Fleeman (An Post) and Ian Stannard (Great Britain) were impressive, and Cummings was clearly the strongest rider of the day, but they were all out-foxed by the French in the finale of the stage. Cummings attacked with Fleeman on the key climb of Mile Hill that took the race onto Exmoor. They powered across to Lequatre who had gone clear alone just after Tiverton but despite working well together, they were caught by Italian Gabriele Bosisio (LPR) and Stannard after 145km. The two emerged from a main chase group of 24 riders that also included Jonny Bellis (CSC), Kristian House (Rapha-Condor-Recycling.co.uk), Roger Hammond (Columbia) and Simon Richardson (Plowman Craven). The rest of the race was left behind under the sombre skies of Exmoor. On the final climb of Cothelstone Hill, Dan Martin (Garmin) dragged four riders, including Berges, across to the leading five. Cummings snatched the final sprint and three bonus seconds that could have been vital in the overall standings. However, riders then started attacking in the run-in to Burnham on Sea and others sat on the quiet man from the Wirral. Berges jumped away with five kilometres to go and quickly got a hundred metre gap. Dan Martin went after him but Agritubel rode a perfect race and Lequatre sat on the talented Irishman, with Stannard on his wheel and Berges then quickly opened a 30 second gap, which could be enough to give him overall victory in Liverpool on Sunday. Despite spending most of the day up the road, Lequatre was still strong enough to take second place, 30 seconds behind Berges, and Bosisio was third. Martin was fourth, Benny De Schroooder (AN Post) was fifth, Stannard sixth, Cummings was an angry seventh and Fleeman was eighth. Russell Downing (Pinarello) lead home the front group of chasers at 1-45. His brother Dean did not have such a good day, finishing last at 28-11. ?It?s great to win, we?re really up to do well in this race after Feillu won last year and we rode a good race,? 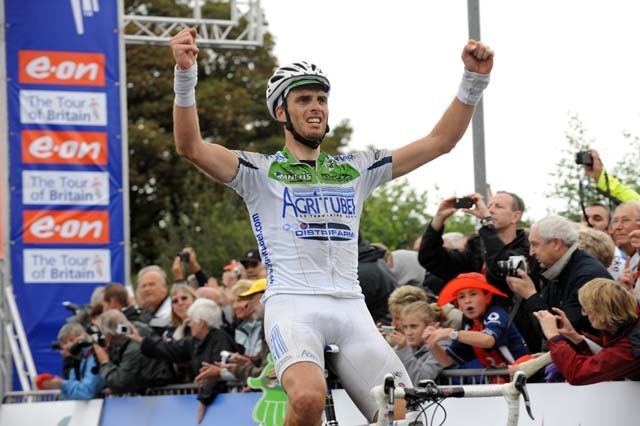 Berges said after pulling on the yellow jersey. ?We were really vigilant at the start of the stage because we knew it would be a tough with all the climbs and the crosswinds. Lequatre got away and then it was good for us to have two riders up there. Lequatre had picked up all the bonus seconds and so I was riding for him. I was on the front but managed to slip away. I?m a good time triallist and so I went for it and knew I was going to win once I?d got a gap.? ?Now we?ll see what happens during the rest of the race. It won?t be easy to control everything because of the many bonus sprints, so it might even be Lequatre who wins overall and not me.? 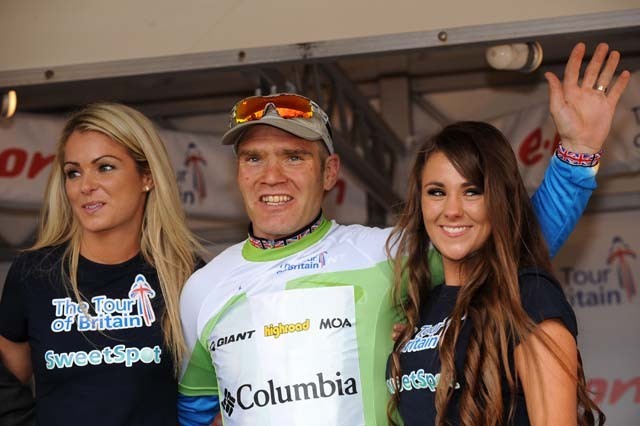 Berges will start his defence of the yellow jersey on Wednesday?s 156km fourth stage from Worcester to Stoke on Trent. The stage will now start in a car park adjacent to Worcester race course because of flooding. The stage north across the Midlands is largely flat with a breakaway of riders out of the overall standings likely to dominate the racing. 10. Russell Downing (GB) Pinarello-Canditv at 1min 45secs. 10. Russell Downing (GB) Pinarello RT at 1min 50secs.